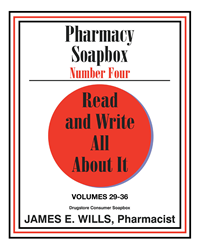 Recent release “Pharmacy Soapbox Number Four: Volumes 29-36” from Page Publishing author James E. Wills is an insightful compilation of opinions and advice on areas ranging from blood thinners to flu vaccines to acupuncture. James E. Wills, a retired pharmacist and fourth-time author, has completed his new book “Pharmacy Soapbox Number Four: Volumes 29-36”: an explanatory work that explores various contemporary drug and healthcare subjects, helping consumers to stay informed. Published by New York City-based Page Publishing, James E. Wills’s elucidative book offers a chance for consumers to have a voice in healthcare and inform others. Readers who wish to experience this revealing work can purchase “Pharmacy Soapbox Number Four: Volumes 29-36” at bookstores everywhere, or online at the Apple iTunes store, Amazon, Google Play, Kobo or Barnes and Noble. Visit http://www.pharmacysoapbox.com for more information on the “Pharmacy Soapbox” series.